The time and the devotion of the Little League umpire often go unrewarded and most times, unnoticed. As a representative of the Jeff/GRC Little League, the umpire shall make every effort to be a good ambassador for Jeff/GRC Little League. As an umpire, you must command respect and enforce the rules of the game. Your decision as an umpire will be frequently questioned. Umpires can and do make mistakes, and should be the first to admit it, should a misinterpretation of a rule occur. There are times when the inexperienced umpire may be tempted to give a "make up call" for a bad decision on the next call. This is poor policy and should be avoided. The umpire must study and know the rules, while also studying the players whose reactions don't always coincide with the adult's. It is only characteristic for players to question the umpire's decisions at times. Instead of taking a player to task for something said, try to let him see your willingness to answer a legitimate question, and solve the problem constructively. Take the time, on or off the field, to share your love of the game with the players, whether it's answering a question or just being friendly. You'll gain their confidence and goodwill, and encourage a positive attitude in them. The Jeff/GRC Little League umpires should be accommodating on the field. Managers shouldn't set a bad example by rushing onto the field and causing a disturbance. When this occurs, the umpire should remain calm and exercise good judgment. Attire is important; making a good first impression when you step on the field goes a long way toward setting the tone for the game to come. You don't have to have the very best uniform, but whatever you wear should be clean and neat. Shoes should be shined, and the umpire's cap should always be worn. The officially issued shirt, along with trousers that are light gray (preferred) or navy blue or black are accepted attire. There are two types of umpire masks, the conventional mask and the hockey mask. The Mask must provide superb protection and clear visibility. 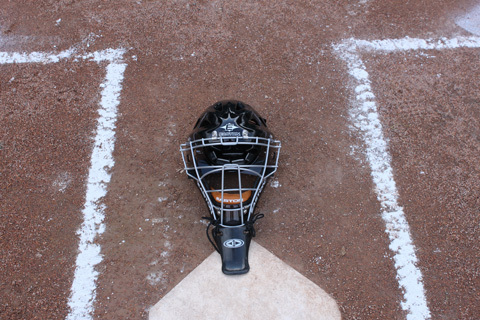 Most umpires prefer the wire mask as opposed to the bar mask. The wire mask consists of thin strands of tempered steel alloys which provide better, all-around visibility. Most wire masks are available with throat and ear extensions welded on as part of the mask frame. These extensions provide great protection as long as the umpire keeps his/her head square to the plate and parallel to the ground. Masks which do not have the 2 inch throat extension welded on as part of the frame should be used with a detachable throat protector. 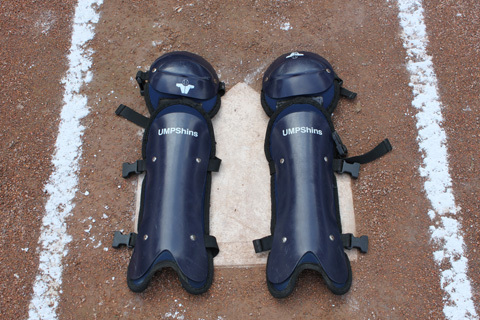 For comfort, umpires may choose the ultra-light alloy metal construction over the heavier steel frame. 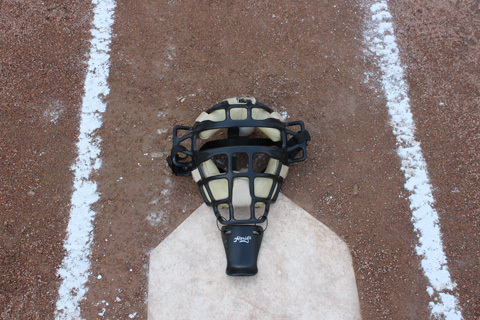 The plate umpire should choose a protector based on protection and comfort. The thickness of the padding, the shoulder protection and the proper fit around the clavicle and throat are major considerations. Chest protectors are manufactured in different lengths. Choose the length which provides the most protection without impairing mobility. Outside protectors are very seldom used today. 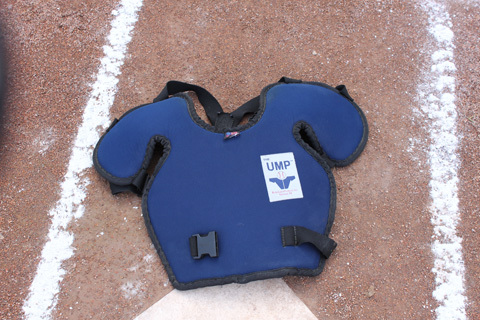 An umpire using the outside protector, a large padded piece of foam rubber, should choose one of the appropriate lengths to accommodate his/her physical size and the proper fit around the clavicle and throat are major considerations. 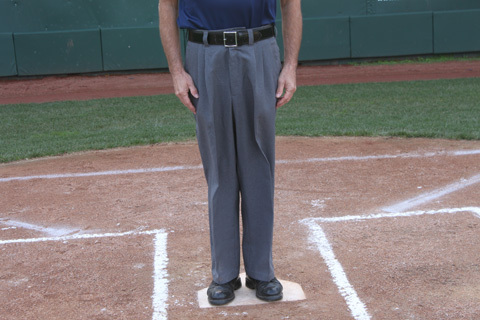 Base umpires should wear black leather athletic shoes which have rubber soles. 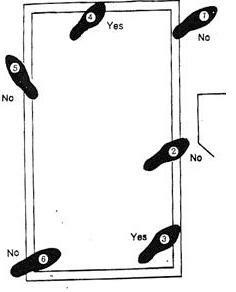 The sole should provide traction for quick acceleration, stops and pivots. Choose a shoe which has a strong counter to help support the ankles. Make sure your shoes have the type of arch support your feet need. The plate umpire should always wear a durable, black leather shoe which is constructed with steel toe and protective flap. These specialty shoes can be obtained through most officials’ supplies stores or industrial worker shoe outlets. (Ask for the steelworker’s shoe.) These shoes are designed to minimize the perils of injury from foul balls, wild pitches and unpredictable catchers. 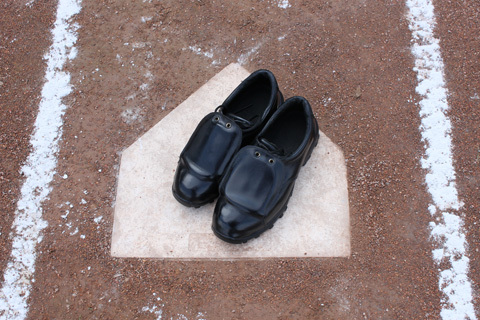 A good plate shoe is a very important investment for the serious umpire. Athletic socks should be worn both on the bases and when working the plate. A thick sock will provide cushioning and protection for a more comfortable fit. A black or dark blue color should be worn to avoid creating a distracting clash. Hosiery which is constructed of a highly elastic material may be beneficial for those desiring extra support in the calves. For special cushioning and absorption, some umpires wear two layers of socks. Generally, they wear a white athletic sock which helps absorb sweat and a dark outer sock which covers the more functional white hosiery. Plate umpires should always use a ball and strike indicator. There are several models, including some with outs and innings. Choose one which best suits your personal tastes and can be manipulated inconspicuously. All indicators are made for use in the left hand and should be used in the left hand. The plate brush should be inconspicuously "kept" in the umpire's ball bag, back pants pocket or shirt pocket. The umpire cap should be an approved color, generally navy or black. The Plate Umpire may wear a Beanie, or Combo hat to minimize problems of the cap fitting under the mask. The Base Umpire may wear a Base, or Combo hat either is acceptable. 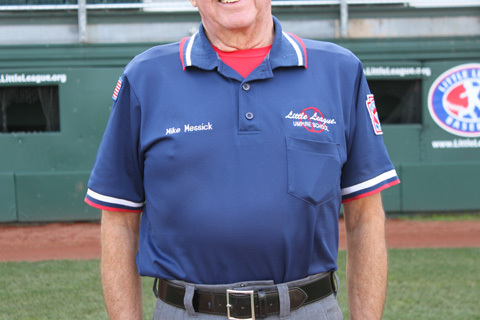 Little League® does not recommend any particular color shirt as its official umpiring shirt. However, the shirt chosen by each league, district, etc. should be uniform in make/style and color for all umpires. Shirts should be clean and neatly pressed. The appropriate Little League® Umpire patch should be affixed to the left sleeve. Plate shirts should normally be one size larger than the base shirt to allow a comfortable fit over the inside chest protector. A comfortable undergarment should be worn beneath the protector to absorb perspiration. Little League® recommends that umpire’s wear gray pants. There are many styles and shades of gray pants, check with your local league or district to determine what style and color pants they would like you to wear. Pants should be clean and neatly pressed. In Little League, there are always many umpires who lack substantial experience. When a veteran umpire is working with a new umpire, every effort should be made to assist the new official however possible, both for a better game and to encourage good habits. Every game is a new game. Don’t worry if you have had a bad game; review it, and try to analyze your mistakes for future correction. Patience is not only a virtue, it’s an essential. The Umpire controls the environment of the game. If you lose your temper, you lose control. Umpires function as a team. They should not be critical of one another on or off the field, and should support each other as necessary. Calls should be made firmly, professionally and without due hesitation. Umpires who are exhibitionists detract from the game and from their own stature. Umpires may be asked to explain a decision, but they should not allow themselves to become involved in an argument about it. Plate umpires should make sure the next batter is ready as soon as the pitcher has finished warming up. Delays can ruin a good ball game. It's up to the umpire to keep players hustling and the game moving. Umpires should always be alert to field conditions that may call for a special ground rule. See to it that managers, coaches, and players are in their proper places during the game, and that equipment not in use is removed from the field. When a decision must be made about calling a game due to weather conditions, darkness, or other factors, all umpires involved should confer before a decision is reached. However, it is the prerogative of the umpire-in-chief or the senior umpire on the field (usually the plate umpire) to make this decision on his or her own. Keep your eye on the ball at all times. This is deceptively simple, so concentrate on doing it. Your partner is the only friend you can count on out on the field. Work to keep it that way. Always let your partner know where you are on the field. Learn to communicate with each other in a voice loud enough to be heard. Remember, the game is largely what you make it. You are an important part of the game but you are not more important than the game. When calling balls and strikes, allow the catcher plenty of room, but get close without interfering. Under Rule 5.09(b), you could cause interference. Watch the pitch into the catcher's mitt, and then wait a full second before making the call. Never anticipate where the pitch will be. Call the pitches what they are. Some catchers will try to "assist" you by calling out "ball" or "strike. Politely remind him that you are the umpire and you will make the calls. When a catcher "pulls" a pitch into the strike zone or "frames" it for you after he makes the catch, warn him to stop it. When catchers do this, they are acknowledging that the pitch wasn't a strike and are attempting to influence your call and/or agitate the fans. Wait until a batted ball settles before calling it fair or foul unless it touches a person or object. Remember that batted balls can strike in foul territory and still become fair balls. Time should not be called before a play is completed. Catchers often ask for time following a base on balls. 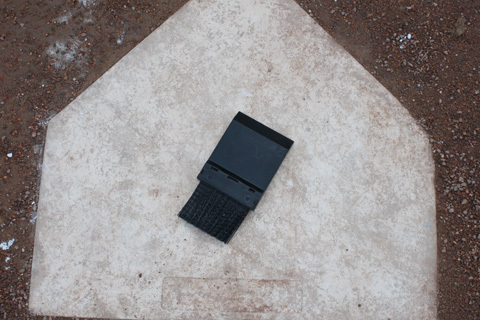 Don't grant time until the batter-runner has reached first base and all other runners have advanced as forced. If necessary, call time once a play is completed. Remember that prompt action avoids many an argument. If time is called too soon, a play that might occur can be quashed before it can happen. Be aware of this possibility, and don't call time (or foul) too soon. Calling time too often will slow down the game. Don't call time unless you're convinced the situation calls for it. WATCH THE BALL. Don't move away from a play too soon. The adage about keeping your eye on the ball at all times can avoid embarrassment, especially if the ball is dropped. If the ball is alive, never touch it. Be alert, and allow the players to handle the ball and so decide the outcome of the play and the game. When a judgment decision is made, no explanation is necessary. Explain a decision only when a rule interpretation is in question. On an appeal play, offer no decision unless an appeal is made properly. Be prepared for the next play. THIS IS IMPORTANT. Appeals are intended to keep the defense on the alert; don't assist them by making a decision before they make a proper appeal. You may get hit or cause other problems if you stand in fair territory to make calls at the plate. Almost every play at home can be called from a position in foul territory. Make every effort to avoid interference. Get into the proper position quickly when the ball has been batted or thrown. Be alert and move fast. Hustle makes a good impression, and it helps you call a better game. Don't make decisions on the run. Stop, and then call the play. Your vision will be jumpy if you're on the move. Be sure that bases are secure and positioned properly. An out of place base can make for a very difficult situation. When getting into position as a field umpire, be sure not to obstruct the view of a fielder. Always check with those behind you before you get set. Get close to every play (but not less than about 15 feet) without getting in the way. Always try to be looking into the play, and avoid being blocked out visually. When calling a play, give up distance to get a good angle. The strike zone is from the armpits to the top of the knees when the batter assumes his natural stance. Stand square to the pitcher. Use the stride stance, with one foot slightly in front of the other (heel to toe). With a right-handed batter at the plate, put your left foot between the batter and the catcher's left shoulder; reverse for a left-handed batter. Have your chin about the height of the top of the catcher's head, and be close to him without making contact. Be sure your position gives you a view of the entire plate. As the pitcher looks in for his sign, stand erect or with your hands on your knees. Always watch for a possible balk. As the pitcher starts his windup, assume the crouch position. Keep your head still and follow the pitch with your eyes from the time it leaves the pitcher's hand until it's caught. Keep your hands down and your elbows in tight. Make the call a full second after the ball is in the catcher's mitt. When the ball is hit, move out in front of the plate to watch the play develop (unless you have a runner at third). Face the backstop, with your back to the pitcher, when you clean the plate. When there's a play at the plate, remove your mask with your left hand and move to the third base side to position yourself for the call. Wait for the play to happen; never anticipate it. Continue to watch the play after it has "happened," especially to see if the catcher has dropped the ball. Once you're sure it's over, make the call. The closer the play, the more emphatic your call should be. If the catcher crowds the inside corner, raise you head a little higher to see both the pitcher and the plate, or adjust to the outside corner. Be sure your new stance allows you a view of the entire plate and the flight of the ball all the way from the pitcher's hand to the catcher's mitt. If the catcher positions himself to one side, set up in your normal position to maintain a good view of the plate and the pitched ball. If the catcher maintains a high crouch stance, move your head higher to get the needed view; don't duck below the catcher's shoulder level. To call a strike, stand erect, bring the right fist forward above your head and call "Strike." Don't make a verbal call when the batter swings and misses; the signal is sufficient. Be more emphatic when calling a batter out on a called third strike. To call a ball, remain in the crouch position and call "Ball" with no hand signal. No explanation of where the pitch was is necessary. Indicate a fair batted ball by pointing (perhaps repeatedly for emphasis) to fair territory, but never verbalize the call. If the batter is still in the batter’s box and is hit by a foul ball, call "Foul!" and raise both hands. On a foul tip, give the foul tip signal, then the strike signal. Do not call "Foul" or "Foul tip." Remember that a foul tip must be caught directly by the catcher; it is not a foul tip if caught on the rebound, or if dropped. When a batter receives ball four, just call "Ball four;" don't point to first. The ball settles on fair territory between home and first or third. The ball is on or over fair territory, including any part of first or third base, when bounding toward the outfield. The ball first falls on fair territory beyond first or third before rolling foul. While on or over fair territory, the ball touches an umpire or any player. While over fair territory, the ball passes out of the playing field beyond the outfield fence. The ball touches any base. A batted ball is fair or foul. A base runner is safe or out. A pitched ball is a strike or a ball. A pitch is legal or illegal. A base runner leaves the base too soon on a caught fly ball. A base runner leaves the base before the pitched ball reaches the batter (Major & below). A base runner did or did not touch a base. A fly ball is or is not legally caught. A hit is or is not an infield fly. Whether or not there is interference or obstruction. Whether or not a field is fit to play. Whether there is sufficient light to continue play. The following situations are based on two umpire mechanics. With no runners, the plate umpire takes all fair/ foul calls, except those down the right field foul line beyond first base. The field umpire has calls down the line beyond the first base bag; the field umpire also must go out on any fly ball or line drive that forces the right fielder to move toward the right field foul line. EXCEPTION: On a popup in the area of first base, the field umpire comes inside and pivots; this gives the fair/foul and catch/no catch calls to the plate umpire. With runners on base, the plate umpire has all fair/foul calls. With runners on base, the field umpire should only call a foul ball that is fouled off the batter in the batter’s box. With no runners, the plate umpire takes all catch/no catch calls on balls hit to the third baseman and shortstop, plus the second baseman if he is moving to his right. The plate umpire also takes all calls in front of the mound, plus the outfield, unless the field umpire goes out. 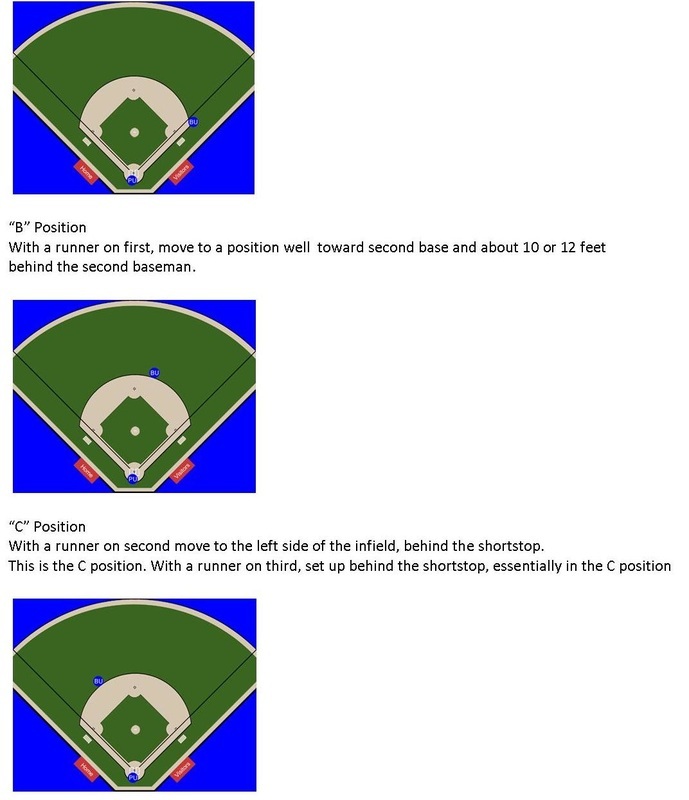 With no runners, the field umpire takes the catch/no-catch calls on balls hit to the first baseman, plus the second baseman if he is moving straight ahead or to his left. EXCEPTION: with a popup near first base, the field umpire comes in and pivots, relinquishing catch/no-catch responsibilities to the plate umpire. The field umpire has catch/no-catch calls when going out on a fly ball (which should only be on plays from the center fielder to the right field foul line), and he or she MUST go out on balls that might involve fair/foul calls down the line. With runners on base, the plate umpire takes all catch/no-catch calls on balls fielded by the third baseman if he is moving toward the foul line. The plate umpire also takes catch/no-catch calls in front of the mound, and on balls fielded by the right or left fielders if they're moving toward the line. With runners on base, the field umpire takes all catch/no-catch calls on balls fielded by the first or third basemen if they move away from the lines, or if the ball is hit directly at them. The field umpire also takes those calls on the second baseman and shortstop, as well as on fly balls hit directly to or between the outfielders. When working on the senior field (90foot diamond), with runners on base, the field umpire should never cross the infield line when making a catch/no-catch call on an outfielder; stay inside the diamond. During ground rule situations, the plate umpire has primary responsibility for any batted ball that goes out of play, unless the field umpire goes out, in which case it belongs to the field umpire. On any thrown ball that goes out of play, the umpire closer to play will generally call "Time," but the other may make the call if he or she has a clear view of the play. In an infield fly situation, the umpires will have signaled each other that it exists. Either may call the infield fly (remember: after the ball reaches the top of its arc) once the decision has been made. If the ball is near one of the foul lines, the plate umpire should initiate the call by saying, "Infield fly, if fair!" The field umpire will then echo the call. If the ball is behind the pitcher, the field umpire initiates the call, especially if a fielder has to run any distance for the ball. The field umpire will be in the best position to determine if the ball can be caught with ordinary effort. There are two situations when the plate umpire takes the play at third; it is crucial in both that the field umpire know where the plate umpire is. (a) With a runner at first only, the plate umpire is responsible for any play on that runner going to third. When it becomes apparent that there will be such a play, the plate umpire will quickly move into position, yelling, "I've got third, I've got third! (b) With a runner at second only, or with runners on first and second with fewer than two out, the plate umpire is responsible for a play on the runner coming to third if he tries to advance on a fly ball. When the runner tags up at second, the plate umpire moves quickly into position, calling out to the field umpire, "I've got third if he comes!" The field umpire should acknowledge that the message was heard. If there's a checked swing, the plate umpire should make the decision when the pitch is called. If a strike is called, there is NO appeal. If the call is that the batter did not swing, and the catcher (NOT the coach!) requests that you check with your partner, and then point with your left hand to the field umpire and ask, "Did he go?" Your partner should respond immediately with either the safe signal and "No, he didn't go!" or the out/strike signal and "Yes, he went!" The indication of this is the same as any other safe or out call. If you're working a Senior (90foot) diamond and there are two strikes on the batter, and there's any doubt about a checked swing, the plate umpire should go to the field umpire for help immediately. The batter is entitled to know his status right away, in the event the catcher drops the ball. If the batter fouls the ball off himself, the catcher, or anything else and the plate umpire doesn't see it, the field umpire should immediately call "Foul'" (more than once, if necessary) to stop play. In the case of a swipe tag on the batter-runner because the first baseman is pulled off the bag by a bad throw, the field umpire should make the call if possible. If he or she is unsure of the play, and knows that the plate umpire is on the first base line, and knows that if there was a tag it was made before the runner reached the base, then the field umpire doesn't make the call. Instead, he or she points to the plate umpire and ask "Was there a tag?" The plate umpire responds with either a safe signal and "No, he missed him!" or an out signal and "Yes, he tagged him!" On a play where the hitter's batted ball is fielded along the first base line and the fielder tries to tag the batter-runner, the call is made by the plate umpire if the tag is attempted between home and the point where the running lane begins (half way up the line). If the batter-runner is beyond that point, the field umpire has the call. Take a position about 10 to 15 feet behind the first baseman, with both feet in foul territory. If the first baseman is playing deep, 10 feet is enough; if he's playing even with the bag, 15 feet is better. Allow the first baseman to move to the ball without running into you, and react accordingly. Take a position about ten feet behind second base on the first base side of the diamond, in line with second and third. You should be one to three steps into the outfield grass, depending on the depth of the infield area. Position yourself in the infield on an imaginary line running from the first base side of home plate to the edge of the dirt circle (or bottom) of the first base side of the mound, approximately half way between the mound and second base. You should be square to home plate and down in the set position (both hands on your knees). Assume a position about ten feet behind second base on the third base side of the infield, in line with first and second bases. You should be one to three steps into the outfield grass, depending on the depth of the infield area. Take a position in the infield on an imaginary line running from the third base side of home plate to the edge of the dirt circle (or bottom) on the third base side of the mound, about half way between the mound and second base. You should be square to home plate and down in the set position (hands on both knees). With multiple runners on base, the umpire works to find a position from which all the runners and the pitcher and batter can be seen. At the same time, the umpire must be aware of the defense and not stand in the sightline between any fielder and the pitcher, nor between any fielder and the batter. The umpire will be ahead of the lead runner when that runner is not on third base. That is, when there is no runner on, when there is a runner on first only, and when there is a runner on second, the umpire will be nearer the base the lead runner is going toward. The umpire is watching for runner(s) leaving early, for batter's checked swing, for catcher's interference, for foul balls, and for activity anywhere on the field and dugout areas that requires umpire ruling or interaction. With no one on base, the umpire stands in foul territory behind first base. 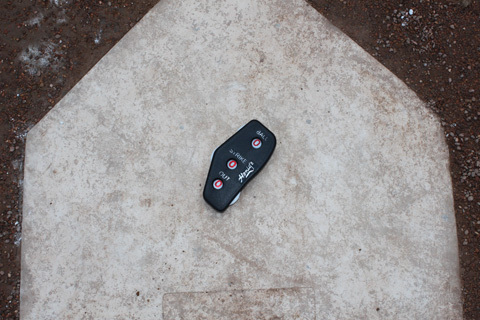 The right foot is about eight inches from the foul line and the position is about 12 or 15 feet behind the base. If the first baseman is playing deep, be sure to be behind (out of the peripheral sight line of) the first baseman. With a runner on first, move to a position well toward second base and about 10 or 12 feet behind the second baseman. Pitcher is ready to throw and batter is ready to hit. The batter's feet must be entirely within the batter's box. The lines are considered to be completely within the box. If the umpire sees this condition, call time and request the batter getter properly set in the box. The hands are part of the bat. If a batter is hit on the hands while swinging at a pitch or while his hands are in the strike zone, it is a strike. Otherwise, it is a hit batter and he gets first base. In all cases the ball is dead and no runners may advance. See Rule 2.00 BALL, PERSON, STRIKE (e), (f), TOUCH, also Rule 6.08(b). He held the ball for two seconds before he dropped it. That's a catch. The catch was made on the outfield grass. That's not an infield fly. He gets 1 plus 1 on an overthrow. There is no such thing. Awards of bases can be 1, 2, or 3 bases depending on the circumstances. The award can be based on where runners are physically standing, or in most cases, from where they are at the time of the pitch. It makes no difference in which direction a runner is running. If a runner is being chased back towards first base from second and the ball is thrown out-of-play, he is awarded third. This is two bases closer to home from where the runner was at the time the ball was released. See Rule 7.10(c). The batter turned to the left after crossing first, so he's out when tagged. The runner is out only if the umpire judges that he made an attempt to go to second. No place in the rules does it say that a runner must turn to the right. See Rule 7.08(c) EXCEPTION and Rule 7.10(c). A foul-tip is a ball that goes sharp and direct from the bat to the catcher's glove, and is caught. If it is not caught it is a foul ball and the ball is dead. If it is caught, it is a strike and the ball is alive. See Rule 2.00 FOUL TIP. The ball is dead when an illegal pitch occurs. When an illegal pitch is called, if the pitcher does not pitch, the umpire will call illegal pitch. If the pitch is thrown, it is a delayed dead ball. This means the ball is alive until any play is completed. See Rule 8.05 PENALTY. On that throw to home, the catcher was blocking the base path before he caught the ball. Call interference! When the defense blocks the base path without having possession of the ball, or is not in the act of fielding a ball, it is obstruction, not interference. If a fielder is about to receive a thrown ball and if the ball is in flight directly toward and near enough to the fielder so he must occupy this position in order to receive the ball, he may be considered in the act of fielding a ball. See Rule 2.00 OBSTRUCTION. Also, see Rule 7.06(a) and (b). The batter who batted out of order is out. After the incorrect batter completes his at-bat, and an appeal is made, the proper batter is out, (the one who would have batted). The improper batter (the one who did bat) is removed from base and any advance made by runners because of his batted ball, is nullified. The next batter due up is the one who follows the proper batter. See Rule 6.07. The batter isn't out for interference with the catcher if he stays in the batter's box. This is a tough call. If the batter has just swung at a pitch and is off-balance and unavoidably interferes with the catcher, he should not be called out. If he had just let a pitch go, and he had an opportunity to avoid the catcher's play, but didn't, he interfered. See Rule 2.00 INTERFERENCE and Rule 6.06(c). The batter backed out of the box as the pitch was coming to the plate. That's an automatic strike. If the offense is stalling and the batter refuses to get in the box after the umpire tells him to do so, then umpire will tell the pitcher to pitch and call each pitch a strike. However, if he is in the box and then steps out during the wind-up or the pitch, the umpire will call the pitch as he sees it. See Rule 6.02(b). The pitch hit the ground before the batter hit it. The ball is dead. If a pitch touches the ground before entering the strike zone and is not swung at, it is a ball. If it bounces up and hits the batter, the batter is awarded first. If it is hit, it is ruled like a normal pitch. See Rule 2.00 IN FLIGHT. The base coach touched the runner. The runner is out. This is a judgment call by the umpire. If the coach obviously and intentionally physically stops a runner or helps him up after falling, the runner is out. Merely touching him as he goes by or making an incidental touch as the runner is stopping is not grounds for an out call. See Rule 7.09(I). Half of the batter's foot was outside the box when he hit the ball. He's out. A batter is out when he makes contact with the pitch when his foot is entirely outside the lines of the batter's box. He is out on either a fair or foul ball. The ball is dead. He is not out if he swings and misses or if he does not swing. See Rule 2.00 ILLEGALLY BATTED BAL and Rule 6.06(a). The batted ball hit the plate first, that's a foul ball. Home plate is positioned between the first and third base foul lines. It is fair territory. Therefore, a ball that comes to rest upon it is a fair ball. All bases are in fair territory; therefore, any batted ball that touches a base is considered a fair ball, regardless of where it bounces after touching the base. See Rule 2.00 FAIR BALL and FAIR TERRITORY.